Northwest Ladybug: Happy Birthday, Danelle! Peter's girlfriend, Danelle, is 20 today! Creative Kat made Danelle a hamburger birthday cake using only brownie mix, yellow cake mix, frosting, and food coloring. Doesn't it look yummy?! 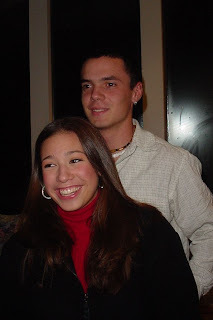 Peter met Danelle when she was 16 and they've been together since just weeks after they met. They're now referred to as "Peter'n'Danelle" and we definitely consider Danelle to be part of the family. I guess sometimes things are just meant to be. Happy Birthday to Danelle from Australia!! and that is one Clever cake - I have a hard enough time making cakes look (or taste) anything like a cake should - so to make one that looks like a hamburger! astounds me. Oh my goodness! This is the cutest couple ever! What a sweet tribute! And Danelle (and Peter) has a WONDERFUL smile! And happy birthday to her!